With Patch 4.3, we’re getting one of the most exiting cosmetic changes ever introduced into World of Warcraft, transmogrification. Fortunately, the WoW community have christened this “Mogging” because quite frankly the word transmogrification is a horrible word to say. When I first heard it I though that it was a term invented by the folks over in Irvine, CA, but apparently it’s been around for a while and the earliest recorded use of the word according to the Oxford English Dictionary was way back in 1656. To change into a different shape or form, especially one that is fantastic, grotesque or bizarre. But of course we’re not here to consider that we want to make our characters unique little snowflakes and look cool at the same time by changing the appearance of our armour to look like another piece of armour. But the big question being asked is how do I get my lovely T12 stuff to look like my uber cool piece of armour? Hopefully this quick guide will help you do just that! Before we look at the what, where and how I’ll just list a few of the very basics that are currently known about mogging. Before you can start to think about changing the appearance of any armour you need to find something to change it to. Now the coolest kids in town will be the paladins who are all gonna look like retro raiders in the T2 Judgement sets but lets face it soon they’ll all be bored of looking the same as every other paladin and go for something different. There are way too many looks to go for for me to cover here but some ideas are old Tier set pieces, old PVP sets, crafted sets but possibly the best way is to compile your own sets from some of the random armour items that WoW has thrown at you in the past. This last option is sort or a labour of love due to the insane number of items available and 2 invaluable sources of assistance here are Wowhead and my favourite, a little addon called MogIt, which can be downloaded from Curse, here.I’ll not cover the details of how to use MogIt as it is quite simple to use but if you need an overview, the guys at WoW Insider did a good review. Now I’ll assume you have acquired your dream look and are all ready to go. If you’re an Alliance player you’ll need to go to visit Warpweaver Hashom in Stormwind. He is located in a building called The Three Winds on the south eastern corner of Cathedral Square. The building is only accessible from the Canal District side not from with the square itself. If you’re a Horde player you could go to Warpweaver Hashom above but I’m sure you’ll attract loads of attention from the guards and players in Stormwind. Fortunately, you guys and gals can get things sorted by visiting Warpweaver Dushar in Orgrimmar. He is located in a new building right in front of the cooking trainer. 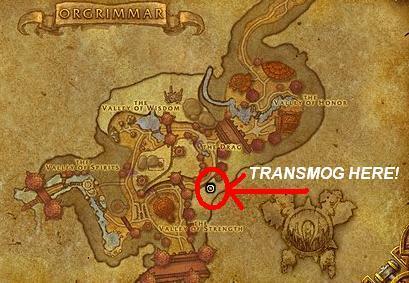 Personally, I’m a bit disappointed that there is only one location for each faction, as it removes the option of basing yourself away from Stormwind/Orgrimmar to get sorted as it forces us all into one city and I’d like to see all teh major cities given a Transmogrifier, but it is still early days yet so lets not panic just yet. 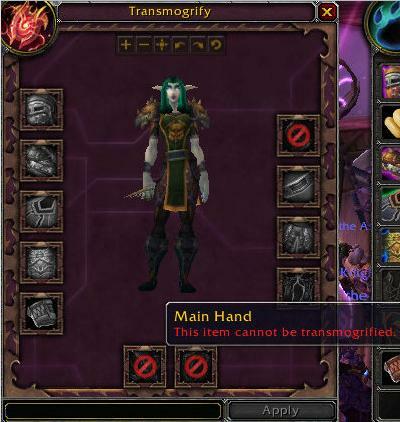 Looking around the act of mogging your armour seems very simple, you speak to the Warpweaver and select the option to transmogrify. This will present you with a new window showing all the slots you can transmogrify, in the image on the left (stolen from Kalliope‘s guide on mogging here over on the Crafter’s Tome blog) the character has a fishing pole equipped and no gloves equipped and therefore the slots for those are blocked from having an item to drag into the slot to transmogrify. Currently on the PTR prices vary from 10 to 25 gold. Working on the assumption that this works the same as Reforging, this would appear to be the vendor value of the item you have equipped and wish to alter, which mean that weapons will most likely be the expensive things to mog. Sadly the only profit to be had here is from the Consortium guys taking our gold from us for the privilege of changing our looks. The closest we come to making a profit is the rise in street cred you’ll get from your new look, unless you’re “that guy” in the T2 Judgement set still hoping to be the unique little snowflake. So my look is going to be the T5, Avatar set from SSC and TK simply cos I love the look of them wings.For us hybrid classes that have tier set items for both sets and often get the sets mixed up this transmogrification business really is cool, as it means we can have 2 sets of really cool looking armour and which also helps us ensure that we have the right gear on too. I do actually carry around a DPS set and sometime use it too so I’m gonna mog that, just not sure what too at the minute mainly because most of the time when DPSing I’ll be in shadow form anyway and the armour is not visible. However, that just means I need to find something with a good looking silhouette! 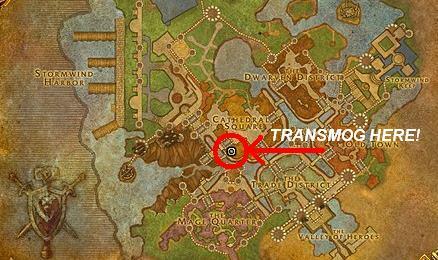 Are you looking forward to transmogrification? If so, what will your 4.3 look be? ← Looking For Raid? Good or Bad? Having just got my full T12 5 piece set I'm not surethat I'll move to the T5 look just yet as the current outfit looks OK. However as soon as I upgrade my chest or shoulders, I'l defo be reverting to the retro look of T5.